by Eliezer A. Agpay, Jr. Some people think that teaching is an easier job compared to others because it involves being around the youth. However, a teacher has many responsibilities and a workload that is arguably much heavier than others, if one truly takes into account everything that a teacher does on a daily basis. 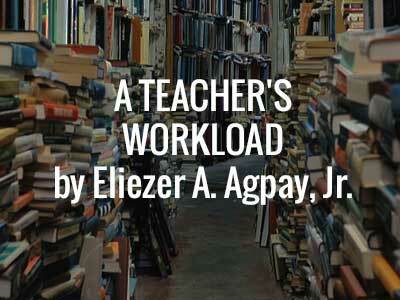 What tasks are involved in a typical teacher’s workday? First and foremost, teachers have to engage in at least six hours of actual classroom teaching and/or equivalent teaching-related activities. To complete the eight-hour workday, two hours of work inside or outside the school premises are carried out in teaching-related activities. These include the preparation of lesson plans, action/work plans, instructional materials, evaluation/assessment tools/rubrics; preparation and checking of exercises; and recording of academic performance results and classroom accomplishments. It is also in this two-hour period that they may conduct educational research or attend seminars, workshops and similar programs for professional development and to add to the body of knowledge on education. They may also engage in counseling, mentoring, coaching of students including home visits and consultations and conferences with parents to further provide assistance to the student that he or she may need to boost academic performance. Teachers, furthermore, may use this time in the performance of coordination activities and duly recognized community social services, or participation in the maintenance and improvement of school facilities and equipment. Meantime, DepEd says that an educator may also serve as Feeding Teacher (with helper), Canteen Teacher, Teacher Librarian, Teacher Property Custodian, Guidance Teacher, ALS Teacher, Teacher Nurse, Teacher Registrar/ School Clerk, Journalism Teacher, Teacher Coordinator, and Sports Coach. These have equivalent teaching loads, as specified by DepEd. Add to these the accomplishment of many forms and requirements by the DepEd. 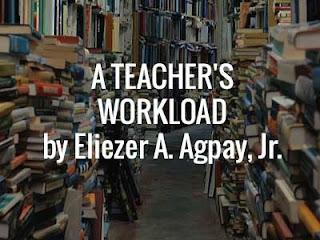 Teachers, however, tend to spend much more time than the eight hours recommended by DepEd in accomplishing these tasks. Especially if they are committed to truly improving the quality of education in the Philippines, and not merely complying with the requirements in order to get a salary, these hardworking teachers tend to put in extra hours. It is these extra hours of work that teachers often clamor for a more commensurate compensation. Furthermore, it is for these extra hours of work that teachers need to be regarded as the unsung heroes of Filipino society. This is not only because they shape the minds of learners, but also because often, the additional work they put in is not paid, much less even recognized by the other members of society. In this light, my advice, therefore, is this: thank a teacher today for his or her efforts, which the teacher often does without much regard for payment but because they truly want to improve education in our country.